To access your General Settings, click ‘Settings’ from your side menu bar then click ‘General’ on the drop down menu. The email entered in the Merchant Email field will be the email where a receipt is sent automatically after every transaction. 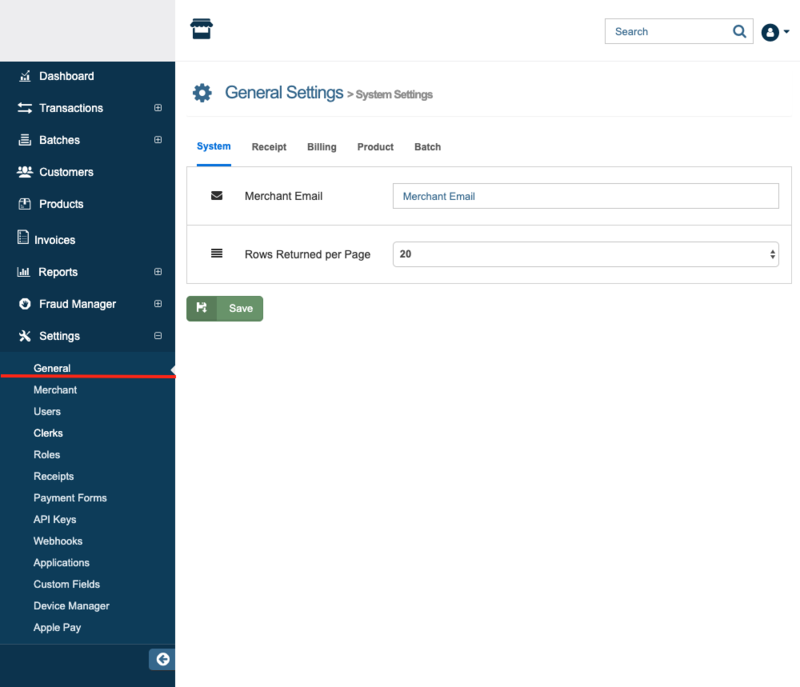 To add multiple emails in the ‘Merchant Email’ field, separate each email with a comma. The Rows Returned Per Page sets the number of rows that will appear by default in every table available in the merchant console. Choose the numbers of rows from the slider or enter a specific value on the number field. Email From: Enter the email address you would like to appear in the ‘Email From’ section of the customer’s emailed receipt. Entering an email address in this field will prevent the customer from receiving an emailed receipt from an unfamiliar email address. You may only enter ONE email address in this field. Email To: Enter the email address you would like your customers to reply to, if they have any questions or concerns regarding their order. You may only enter ONE email address in this field. 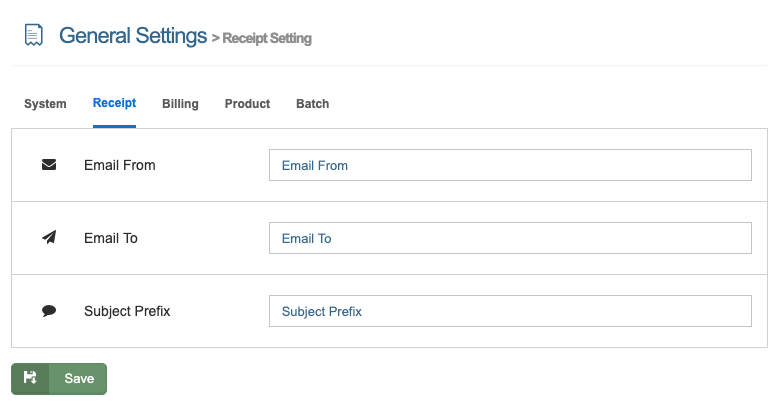 Subject Prefix: This setting allows you to add a prefix to the automated subject of the email receipt. Use something simple, such as your company name (i.e. ABC Company Customer Receipt), so that your customers can easily identify the origin of the email receipt. Retry Count: This is the number of attempts the system can process a recurring billing payment from a credit card if the first attempt results in a decline or an error. Choose the number of retry attempts from the ‘Retry Count’ drop down menu. Note: The max number of retry attempts is 5. The customer’s recurring billing account will be disabled after the max number of attempts is reached. Contact your customer if this happens. API Verify Amount: This setting allows the system to verify a customer’s card by charging a specific amount. Once the card is verified, the funds go back to the customer’s card. Note: You must enter a value greater than or equal to 0.05 for the API Verify Amount. Run Billing Time For Credit Cards: This setting determines the time at which the recurring transaction for credit cards will begin processing (based on the date it is scheduled to run). Enter the time you would like your recurring billing to start running on the ‘Select time for Credit Cards’ field. 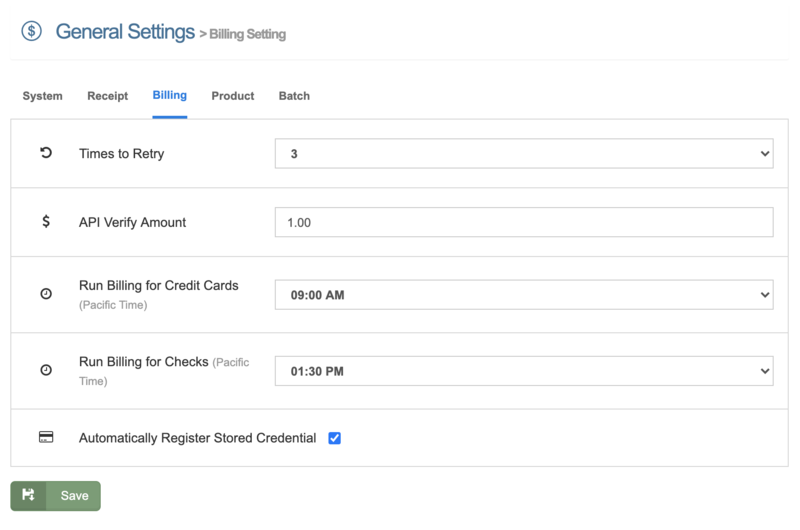 Run Billing Time For Checks: This setting determines the time at which the recurring transaction for checks will begin processing (based on the date it is scheduled to run). Enter the time you would like your recurring billing to start running on the ‘Select time for Checks’ field. The Product Database setting allows you to set your Barcode Prefix and Barcode Sequence. The Barcode Prefix will be first 3 numbers in a UPC (Universal Product Code) barcode. The first 3 numbers in a UPC barcode usually indicates the country the company is based in (eg. The prefix for the United States is 000-019). The Barcode Sequence is the following numbers after the barcode prefix. You may choose to enter any sequence for the barcode sequence of your products. Note: Your prefix and sequence must add up to a total of 11 digits. 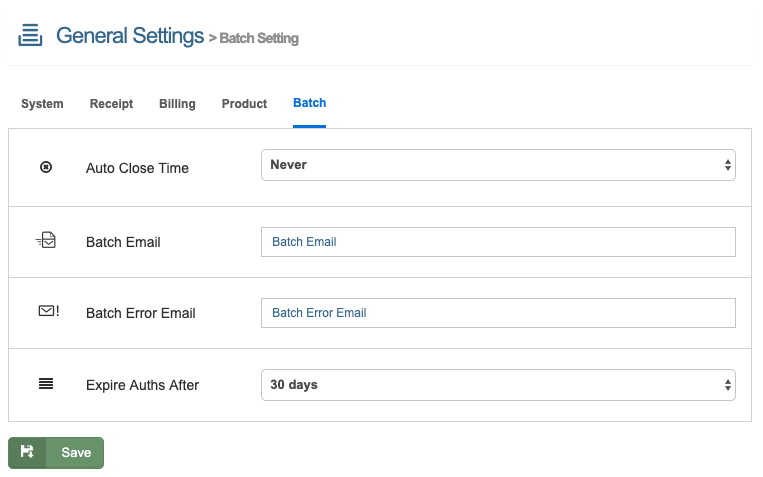 Send Batch Reports To: Enter the email address(es) you would like to have your Batch Reports sent to. To enter multiple email addresses, separate each email with a comma. Send Batch Errors To: Enter the email address(es) you would like to have your Batch Errors sent to. To enter multiple email addresses, separate each email with a comma. Please Note: It is important to set these email notification preferences if you selected the option auto-close. If an error occurs, receiving these emails allows you to immediately take the necessary steps to correct it. Contact customer support or your reseller to further assist you with any issues. Expire Auth Only Transactions: When an Auth Only transaction is processed, it is placed in your Queued Transactions page to await Post-Authorization. Enter the number of days you want your Auth Only transactions to remain in your Queued Transactions by choosing it from the slider or entering the value in the given field. Please Note: Most Auth Only transactions will expire in 7 to 10 business days, depending on the customer's service bank. Once a card has passed its Auth Only expiration, you will no longer be able to run the Post-Authorization and complete the transaction. While you are unable to control the expiration dates for these transactions, this setting determines how long these Auth Only transactions remain in your Queue. The maximum length of time that Auth Only transactions may remain in your Queue is 30 days, but we recommend keeping this setting at 10 days.